This bonsai pot has a round shape and no lip. 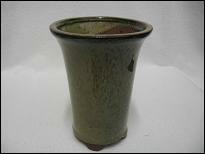 It has an olive green glazed finish and one drainage hole. 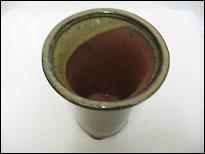 The pot is suitable for cascade style bonsai. Please note: This pot is available while stocks last. The remaining pots have slight defects (scratches, small clips or uneven standing) and for this reason they have been heavily discounted. You will earn 4 points which is the equivalent of €0.40 when ordering this product.